Dakota Fanning wears black high top Converse “Chuck Taylor” All Stars in the film. Fern draws while Wilbur looks over the barn yard. E.B. White’s classic children’s story Charlotte’s Web was written in 1952 and captured the imagination of the baby boomer generation. The story which introduced countless kids to the world of farm animals and their annual life cycle effectively mixes fantasy with reality in a very entertaining and uplifting way. An animated version was made of the story in the 1970s, but this was a story that could not be properly made until recently, when modern technology has enabled Hollywood to make real looking animals come to life. The computerized realization have become so lifelike and effective for movies like this and its predecessors like Babe that it is hard to tell where the real animal ends and the animation begins. With today’s kids entirely focused on media for their entertainment and much of their education, this wonderful story which had been gathering dust on many a bookshelf can now be introduced to a whole new generation. The impact that this story had on the previous generation is clear from the class A cast of actors lined up to do the voice overs for the many different animal characters. 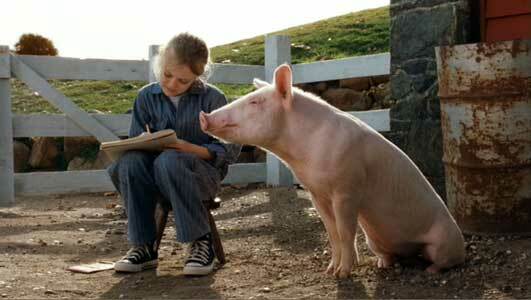 A big change comes in the life of the runt pig Wilbur when Fern must move him to her Uncle’s barn. 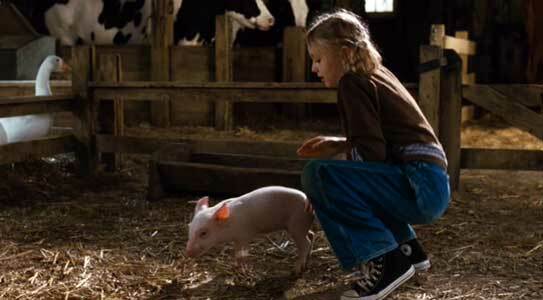 Set in a rual Maine farming community, Charlotte’s Web is the story of Fern (Dakota Fanning) a young girl who saves the runt of a litter of pigs from her father’s axe. She promises to take care of the runt, who she names Wilbur, and raises him as a family pet. For a while things are great as Wilbur becomes a cute and cuddly pet, but soon Wilbur becomes too big to sleep in her bed and stay inside the house. Fern learns the first fact of life about farm animals when she must take him to her uncle’s barn where Wilbur will stay with the other animals. 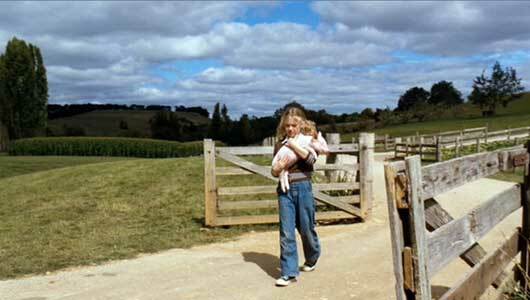 Disoriented and alone for the first time in his life, Wilbur (voice-over by Dominic Scott Kay) at first tries to escape and follow Fern back to her house. But the world outside the barnyard is too dangerous, and soon Wilbur accepts his fate and tries to make friends with the other barn animals: Templeton the conniving rat (Steve Buscemi), Samuel the sheep (John Cleese), Ike the whinnying horse (Robert Redford), Gussy and Golly the goose and gander who trade one-liners (Oprah Winfrey and Cedric the Entertainer) and Betsey and Bitsey, two gossiping cows voiced by Kathy Bates and Reba McEntire. Completing the celebrity voice-over cast are Thomas Haden Church and André Benjamin as two crows we meet later, and San Shepard as the narrator. All of these animals are aloof to Wilbur’s advances, mainly because they know that Wilbur’s ultimate fate is a visit to the smokehouse and an appearance on the human family’s dinner table. 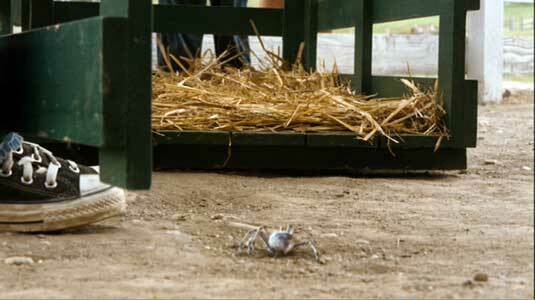 But one creature in the barn is willing to make friends with Wilbur, Charlotte (voice-over of Julia Roberts) the spider, who lives in the rafters. Wilbur gradually adjusts to the barn and learns to live with the other animals. Once Wilbur and Charlotte become friends, Wilbur’s real education in the ways of the world begins. Charlotte decides to help Wilbur escape from becoming a side of bacon. Her plan is simple but brilliant; she decides to make the world of humans think that Wilbur is too special to eat by spinning slogans in her spider web. She spins the words “Some Pig” in a large web right at the entrance to the barn just so that they catch the light. When word of this “miracle” gets out, people from all over the area come to stare at it. Suddenly Wilbur has some star status so he is saved from the snokehouse for the time being. Fern and her family then decide to bring Wilbur to the county fair, and Fern hopes that Wilbur will win a blue ribbon so he can remain a family pet. But at the fair Fern is distracted by an attractive young boy her age who buys her a ticket on the ferris wheel. 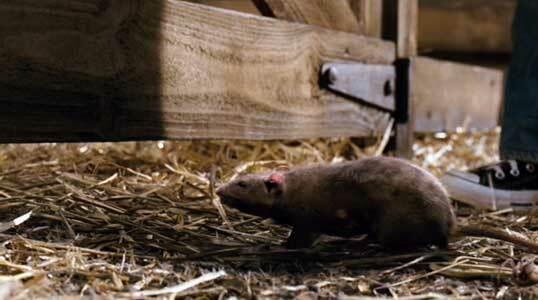 It remains up to Charlotte and Templeton the rat to try and help Wilbur out. Fern wrestles with her younger brother when he tries to capture Charlotte. Charlotte’s Web is filled with timeless messages about life and growing up but they are cleverly intertwined into the story line so you never realized that you are being taught something. The most important of these is that nothing lasts forever, so you should make the most of what is happening now. And even though the story line is filled with fantastic events and moments, it never strays very far from the lessons of real life. This is what gives it its emotional impact at the end, and is the main reason that this story and film has such great appeal to viewers of all ages. One of the most interesting things about the film is how they treated the animation and personality of the spider Charlotte. Of course it is the genius of E. B. White that makes her such a loveable and sympathetic character, considering the arachnophobia that most humans have. This is further humanized by the voice over of Julia Roberts, and the closeups of the spider’s face are smoothed over so that she doesn’t appear threatening at all to viewers. 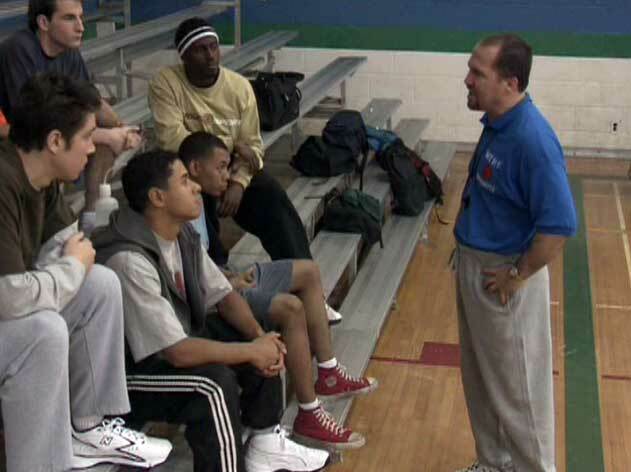 The screenplay and direction remain true to the intent of the book. Interestingly, as the story progresses we become more engaged in the animal characters than we do with the human ones. Other than Dakata Fanning’s Fern, the only other human character who make much of an impression are Beau Bridges as the family doctor, and Fern’s mother and father, played by Essie Davis and Kevin Anderson. Director Gary Winick provides Charlotte’s Web with a steady comfortable pace, anchored by Sam Shepard’s narration. This lets the viewer concentrate on this story of friendship and loss, which has an amazing power to move the viewer even in today’s world. This is first rate family fare; don’t miss it! 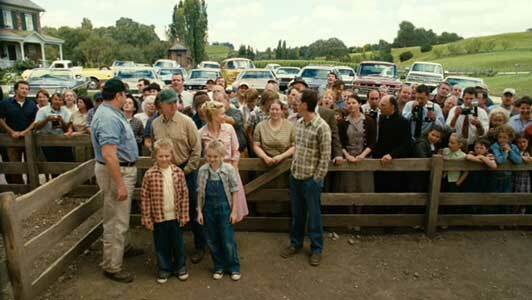 All the neighbors come to see the messages in Charlotte’s web. Charlotte makes her way into Wilbur’s pen that will take him to the fair. 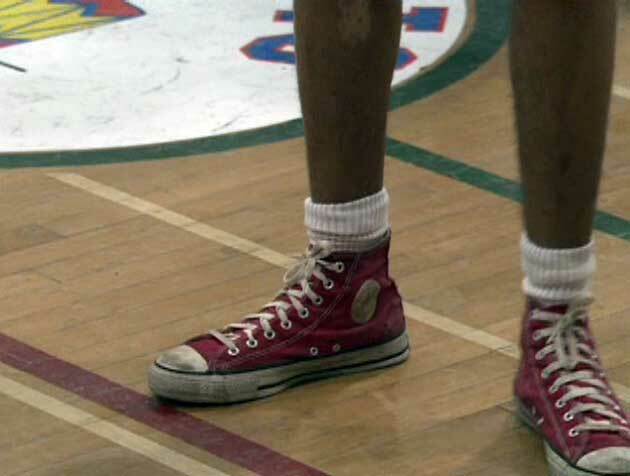 Dakota Fanning wears black high top chucks in most of the scenes that she appears in. Her brother also wears black high tops but they are “wannabes” and so don’t have the classic look that her chucks do. The best closeup shots are when Fern is with the animals. Templeton the rat plays a key role in Charlotte’s Web. Charlotte’s Web. (2006) Dakota Fanning, Kevin Anderson, Essie Davis, Louis Corbett, Julian O’Donnell, Robyn Arthur, Siobhan Fallon, Gary Basaraba, Beau Bridges, plus voice overs by Julia Roberts, Steve Buscemi, John Cleese, Oprah Winfrey, Cedric the Entertainer, Kathy Bates, Reba McEntire, Robert Redford, Thomas Haden Church, André Benjamin, Dominic Scott Kay, Sam Shepard. Directed by Gary Winick.